Earlier this year, Safehouse was hired by the National lending company On Deck located in New York to shoot a customer testimonial video in Raleigh, NC. Once we were finished , we were interested in how they were going to utilize this testimonial. We discovered that the video clip was being used in a Social Media Marketing campaign. We also discovered several other videos that had been shot around the country highlighting different clients that used their services. We assume that they hired local videographers for those shoots as well. 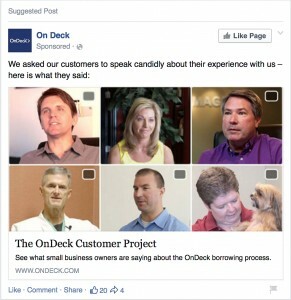 The image here shows a Facebook ad with 6 different thumbnails from 6 different interviews. Our video is the thumbnail used on the top right. You can see clearly the difference that four point lighting makes in a video production. It helps to separate the person on camera from the environment and gives a clean, polished, and professional look. More and more companies are using video shoots like this one to get their message out to the masses because Social Media Marketing has become a very effective advertising tool. Just because you don’t have a large budget to spend on video production doesn’t mean that you should settle for standard or below standard production. We at Safehouse pride ourselves on providing professional and high quality video production at an affordable price.